Before the Ballets Russes reached Paris in 1909, the French ballet had fallen asleep on its laurels. Our teaching was flaccid. The instructors lacked drive, because they no longer felt strongly about what they were doing. Then Cecchetti came to town with the Ballets Russes. That woke us up with a start! The teachers were stimulated – and so were the dancers! I myself never had occasion to work with Ricaux, because when I came to the Opéra in 1943 he had stopped teaching there, and only gave private lessons. What Ricaux contributed – among so many other things! – was swift and easy use of the legs in petite and grande batterie. A marvellous teacher he was! Just look at Babilée, how he could beat! Ricaux, like Peretti, had worked with Nicola Guerra, who was a very great teacher – a Master, really. My sister Lycette [Darsonval] worked with him, and told me so much about him. His teaching was very like that of Cecchetti. At the time, it was the Italian School, that great current reaching us from Italy, that passed the torch, because it was far more brilliant than the French. 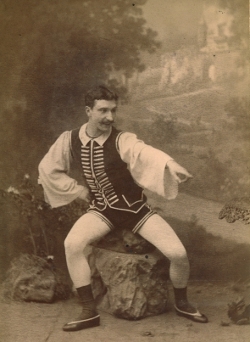 When people saw Vaclav Nijinsky, they saw what the Italian School had achieved! And teaching went down that path! Now, it is true that it was in France that Vestris and Gardel had taught. They were the rocket-launchers, but then somehow, the French School withered away here, while it flourished elsewhere. Early in the Twentieth Century, the Russians and the Italians brought our own School back to us! Rather like the Spaniards with their Riding School! Born in 1920 and trained at the Opera School, Serge Perrault – half-brother to Lycette Darsonval – made his début at the Paris Opera in 1943. In 1947 he left the Opera to pursue an international career. Etoile with the Metropolitan Ballet (1947-1949) along with Erik Bruhn, Svetlana Beriosova, Sonia Arova and Celia Franca, he later joined Les Ballets de Roland Petit as étoile. In 1953, he worked as dancer-actor with the Compagnie Renaud-Barrault. Between 1977 and 1987 he taught at the Opera.